Enterprises have long been looking for solutions to monitor large areas of their premises from all directions to ensure 360-degree security. Talking of 360 degrees there is only one camera that comes in mind that is the PTZ (Pan/Tilt/Zoom) Camera. 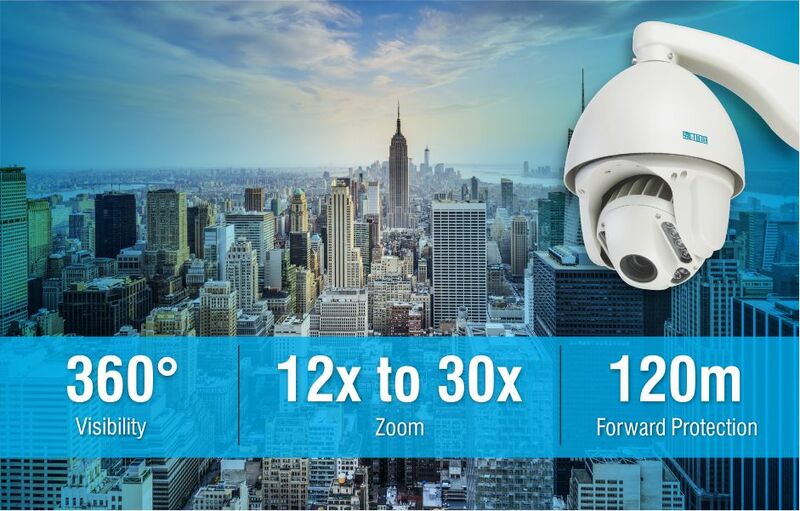 Well, many other cameras available in the market but the PTZ cameras have time and again proved to be one of the best outdoor security solutions for monitoring large areas. Let’s see how. From flexible rotation to the optical zoom, Matrix Security solutions offer 7 reasons to include PTZ cameras in your security team. As we know, PTZ Cameras tend to cover a much wider area of the premises and hence, eliminate the need for a bunch of cameras for the same. This not only makes installation a faster process but also reduces the initial cost of deploying a camera. Viewing a wide area but without clarity is pointless. It’s like knowing something is happing but not knowing what? Matrix Cameras provide exceptional Image Quality and are built using superior components such as SONY Starvis sensors for high-resolution videos. Matrix 2MP PTZ Cameras can cover a full 360-degree area. Both pan and tilt can be pre-programmed or done manually depending on the location these cameras are deployed at. These cameras are a good choice for areas like parking lots or roads where otherwise we would need to install multiple cameras to cover the entire area. Hence, two to three PTZ cameras can fulfill your requirements rather than deploying 10 or more cameras to monitor the same area from different angles. This helps to minimize your cost without compromising on the total security of your premises. This proves to be a very efficient way of providing proactive security. Matrix PTZ Cameras are available with a viewing ability of up to 120m. The ability to zoom in on a person or object is from around 12X to 30X. This is beneficial for places like railway stations or building tops where the camera is far away from objects and people, but its optical zoom can still zoom in on them and give a clear picture of what is going on. Night Vision is one of the most critical features in Video Surveillance systems. This is due to the low light conditions during that time. The amount of light is so low that it becomes extremely difficult to have a proper vision through cameras. However, PTZ Camera can capture images even in total darkness. This becomes possible due to the small IR LEDs placed inside the camera which automatically switches on and emits light as soon as the camera is unable to get a proper amount of light from the surrounding. This produces a clear view of the scene even during night time. The PTZ Cameras are ideally mounted high above the ground. This enables a wider view and allows it to rotate 360 degrees. This also keeps the cameras protected as it is not within the reach of everyone. This makes it tamper-resistant because it is practically impossible for a person to easily reach such a height. It also has a protection level making it difficult to tamper the PTZ cameras. What features to look for in Video Management System? How to Choose the Best Network Video Recorder for your Business? How Matrix IP Camera Solution Facilitates A Giant Firm In Maharashtra?